Greetings, it seems like the weather was just starting to feel like winter but the days are already getting a bit longer and spring is just around the corner. As usual, we closed out the year with our annual holiday party. A big thank you to George and the rest of the team at Victor Stanley for sponsoring our annual event. NMASLA has been busy making preparations for 2018 and planning efforts are underway. Judith Wong has been instrumental in organizing our Q1 event. She has been working with the owner of Los Poblanos Historic Inn & Organic Farm to put together a day of walking tours and educational lectures. The event is scheduled for April 27th, keep an eye out for registration information as attendance will be limited to 30 ASLA members/students. Rob Loftis has been busy heading up advocacy efforts as we move towards our sunset review scheduled for later this summer. He has been working with a committee of NMASLA members and our lobbyist, Erin Marshall, to coordinate efforts and keep one step ahead of the upcoming review session. Please keep an eye out for a legislator informational request as part of this newsletter. The committee will be compiling a list of our representatives in order to consolidate advocacy efforts. 2018 is shaping up to be another busy year and NMASLA looks forward to providing our members with several opportunities for continued education and community outreach. As always, if there is anything we can do to support our membership please let us know. On Saturday, November 11, 2017, ACE Leadership High School and NMASLA held their third annual Pop Up Playground. The event attracted at least 217 guests including 129 children and 88 adults including many returning parents and children. The Pop Up Playground is an event designed to encourage free play where we provide the materials, tools, assistance and space to allow children to create their own playground. With cardboard, tissue paper, duct tape, pallets, pvc pipe, hammers, nails, drills and whatever loose parts we can pull together, children work together with each other and their families to build and paint forts, catapults, costumes, cars, ships, unicorns and whatever their imaginations may inspire. To learn more about free play, alternative playgrounds and national pop up and adventure playgrounds, as well as our past and future events, follow our Facebook page “Pop Up Play NM” at https://www.facebook.com/Pop-Up-Play-NM-504335279768108/. ACE and NMASLA plant to continue this annual even in 2018. This event couldn’t take place without the material donations and financial support of our many sponsors. Thank you! "The year 2018 marks the 100th anniversary of Philadelphia’s Benjamin Franklin Parkway! This is the city’s grand, green boulevard linking the center of our city to Fairmount Park - the city’s largest (over 2,000 acres). The Parkway took 70 years to build, undergoing countless design changes due to conflicting visions and economic conditions, and is not considered “completed” compared with most of the plans. Construction of the Parkway required demolition of over 1,300 buildings as well as radical changes to Philadelphia’s street grid. Even with these challenges and limitations, the Parkway has been wildly successful in providing both a physical and psychological connector for generations of residents to Fairmount Park and the cultural institutions located along the Parkway. Philadelphia has a wealth of other natural resources and cultural institutions which would similarly benefit from better linkages to their surrounding communities and with each other (perhaps with fewer demolitions than the Parkway required). This year’s challenge seeks creative and open interpretations of what a new ‘Parkway’ could be in a dense and developed 21st century city and invites teams to share your grand vision for how Philadelphia’s existing natural and cultural resources could be better linked with their neighboring communities - both physically and in the minds of residents and visitors." 2018 Better Philadelphia challenge, Philadelphia's Next Park+Way design competition Smart Weave by UNM MLA student Samuel Fantaye is a design proposal that primarily uses Smart trails, an intricate network of pathways interconnecting existing neighborhood to adjacent neighborhoods and green spaces and areas of interest. These User defined, technologically augmented, and green trails linking neighborhoods along the corridor are the foundation for the influx of art, technology, and green infrastructure. Smart trails will engage Lehigh corridor’s rich history, culture, art and open spaces to create a thriving, interconnected, vibrant and sustainable green corridor.Intersections of these green streets are marked by public arts such as art installations, sculptures, and mural arts. The city of Philadelphia's open data policy made most GIS data accessible, that helped and facilitated both the analysis and design process. Smart weave is an intricate network of pathways connecting: neighborhood to neighborhood, neighborhoods to nature, and nature to nature. Trails installed with smart monitors will foster healthy community by encouraging active lifestyle, providing health tips and accessibility features for elderly and disabled people. Sculptural street light not only provide lighting but function as a modular furniture for seating, charging and accessing Wi-Fi. It’s rustic quality and texture evokes the rich industrial history of the city. Trails reinforce the symbiotic relationship between the natural environment and adjacent neighborhoods. Green streets improve shade and microclimate, and further extend wildlife habitat which results in a healthy and thriving environment for both agencies. The perspective shows the newly established parks along both rivers, Delaware and Schuylkill, anchoring the corridor. The park includes boat ramps, beaches, art installations and wildlife corridor. Growth diagram showing organic development of the corridor. User defined trails linking neighborhoods along the corridor are the foundation for the influx of art, technology, and green infrastructure. Intersections of these green streets are marked by art installations. Volunteered tracked use along the trails will be used to inform future design decisions. Solar power center inserted into existing parking lots contributes power to cars, street lights, art and Wi-Fi hotspots. Engaging Lehigh corridor’s rich history, culture, art and open spaces to mark smart trails; technologically augmented green pathways connecting multiple neighborhoods. The perspective above is a typical example of user defined pathway showing a vibrant space, shade trees with adjacent storm water management, designated bike lane, health tracking monitors & solar powered street lighting. 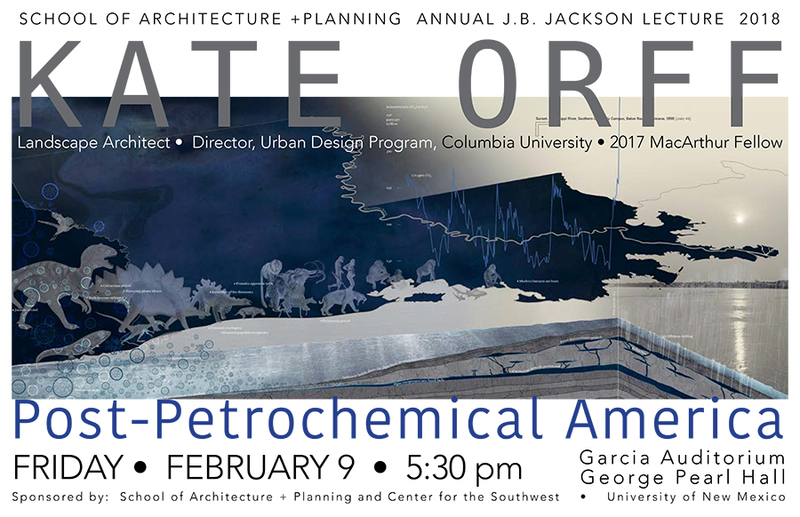 NMASLA participated again this year in The ASLA Public Awareness Summit which convened on January 5 through 8 in Austin, Texas. The annual summit brought together representatives from 46 of 49 chapters from across the country to shape the American Society of Landscape Architect’s public awareness campaigns for 2018. The summit was the first meeting of the Public Awareness Coalition, which formalized the 49 representatives as an advisory group to ASLA on all public awareness initiatives. It is important to create a solid understanding of our profession in the eyes of general public and the attendees brainstormed several ideas to raise public awareness in 2018. The participants also debated ideas for World Landscape Architecture Month (WLAM), how to implement ASLA’s rebranding plans, and how ASLA can better aid chapters on a local level. If you have any ideas or would like to be involved actively in NMASLA’s public awareness campaign, especially during the WLAM, contact Jitka Dekojova. NMASLA is preparing for the Licensure Sunset review scheduled for Summer of 2018. We need your assistance. We are building a database of our members and who their state legislators are. All of us will need to begin reaching out to our legislators in the near future and we want to document those contacts and track legislators who are supportive. We also want to avoid too many contacts from members with a legislator who is already pledged their support. Our legislators have day jobs, no staff, and are already overwhelmed. When you are asked to contact your legislator, we will get together and discuss our message and give you some talking points and handouts. Call for comments: Recently the City Council of Albuquerque voted to adopt the Integrated Development Ordinance (IDO), which is a major overhaul of the zoning code. There is now in a 6 month period seeking comments from the public, before the IDO becomes effective. As the landscape section of the zoning code is being replaced by this newly written document, landscape professionals have a chance to voice their opinions about the regulations. You can find the most recent draft here: https://abc-zone.com/sites/abc-zone.com/files/document/pdf/IDO-Adopted-2017-11-29-rev.pdf with regulations pertaining to landscape design starting at page 227. The project website https://abc-zone.com/ lists the project manager’s direct contact info: Mikaela Renz-Whitmore, mrenz@cabq.gov 505-924-3932. You can also provide comments directly through the website. The Future City Competition was held this month, in which nearly 50 teams totaling nearly 250 middle school students from the State of New Mexico presented their work at UNM’s School of Architecture and Planning. Each project consisted of a project plan, a virtually designed city, an essay describing their city, a physical model, and finally student presentations. For the second consecutive year, Jitka Dekojova and I were members of a regional panel of judges that scored students projects based on a set of rigorous criteria. This year’s theme required students to create a design that accommodated our aging population, and focus on ways to better the life of senior citizens. Students work was innovative, refreshing, and inspiring. If you would like to get involved as a mentor or regional judge, please feel free to reach out either Jitka or myself and we would be happy to answer any questions you might have. It requires a minimal amount of our time, but the project creates a lasting impact on our future generations. 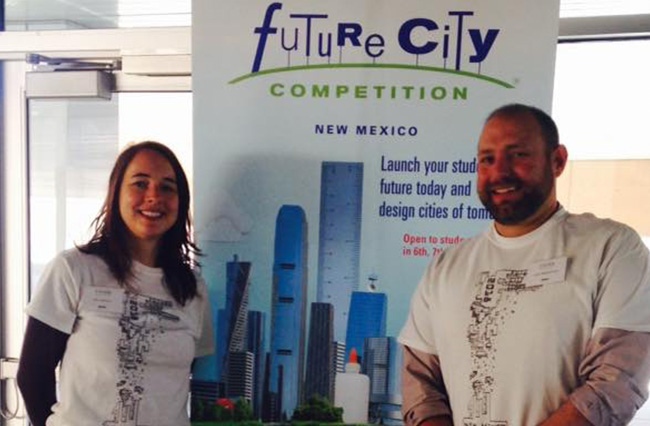 Jitka Dekojova and Justin Weathermon served as regional judges for New Mexico's Future City Competition. In April of 2017, I joined Groundwork Studio as a landscape designer. I enjoy the diversity of the projects and the collaborative and experiential approach of the studio. Two current projects on the boards, include fieldwork and data synthesis for the NM Statewide Community Forests Tree Analysis and Management Plan, which looks at the health and diversity of urban forests across the state. And, an amazing project with the Taos Land Trust to develop a master plan for a 20-acre parcel on the Rio Fernando. This includes wetland and acequia restoration, habitat creation, as well as art and agricultural programming. Prior to working with Groundwork Studio, I lived and worked in Philadelphia, PA, where I taught art at the university level. I have an MFA from Tyler School of Art. My interest in the discipline of landscape architecture began while researching the connection between land art, public art and urban design. During this time, my work moved out of the studio and into the public sphere through work with the Mural Arts Restored Spaces Initiative to integrate art and landscape into city spaces. My personal design concerns center around aesthetic issues more typically associated with site specific sculpture: site lines, tactility, scale and creating a gravitational point in a landscape. As a way of continuing my research into the relationship of art and landscape architecture, I pursued and was awarded an MLA at UNM. Working with faculty in the Art and Ecology and Landscape Architecture programs was pivotal to my research. I’m interested in how designers can promote an experiential and ecological approach in urban and rural design in the arid Southwest. The interface between these issues is a fascinating place to work. The school semester at UNM SAAP just started so I encourage you to check in with your mentees. A quick note to wish them well and offer help with their work would help the students to let them know you are there. Many of them might be thinking about summer internships soon and could use your eye for a portfolio review or resume polishing. If you have any questions or ideas, please contact Jitka Dekojova.